J. C. (John) Beaglehole was the great historian of British explorer James Cook. Beaglehole had developed an interest in the discovery of New Zealand in the 1930s, and late in that decade he was given an official position, based at Victoria University College, to research and edit the journals of Cook and Joseph Banks, a scientist who sailed with Cook. Beaglehole spent the rest of his life on the task and died in 1971 just as he completed a biography of Cook. 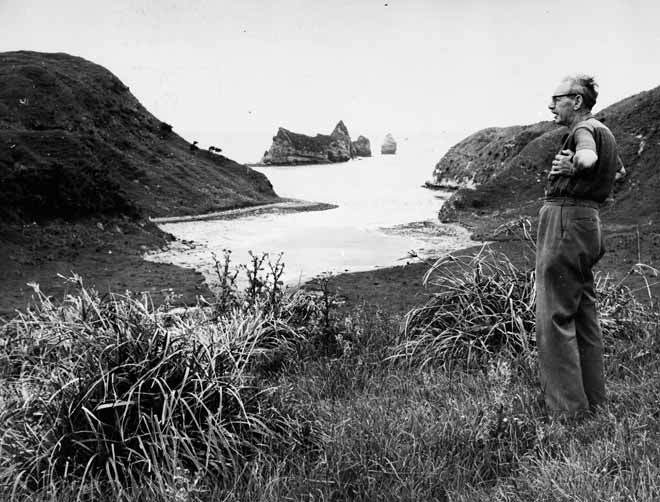 Beaglehole is shown here in 1965 helping the Historic Places Trust to select a site for a stone memorial to commemorate Cook’s visit to Cook’s Cove, which is near Tolaga Bay. In the 1940s Beaglehole had also served as the chief historian of the Historical Branch of the Department of Internal Affairs.